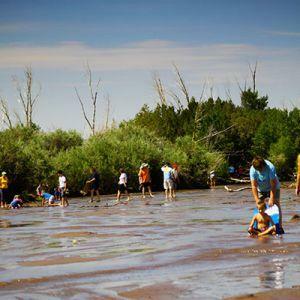 Against the backdrop of rugged 14,000' peaks in the Sangre de Cristo mountains—the 30 square mile sand dune field, with no designated trails—invites you on an adventure. The natural system of the Park ranges from great sand dunes to forests, from cottonwood groves to majestic mountain peaks and tundra. The highest elevation in the park is 13,604' above sea level. 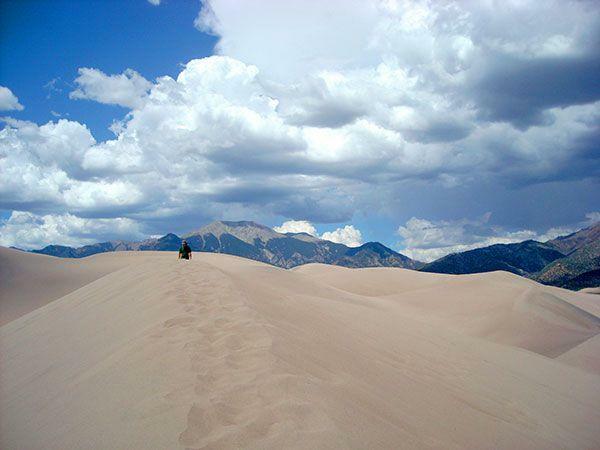 The Great Sand Dunes Visitor Center and campground areas are at about 8,200'. 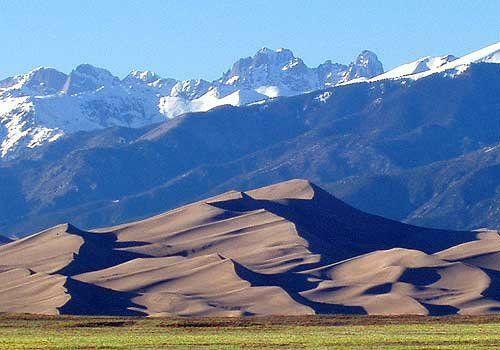 Recent scientific research suggests that the Great Sand Dunes in Colorado began forming around 440,000 years ago, after a large inland lake that once covered the San Luis Valley - named "Lake Alamosa" when evidence of the lakebed was discovered in 2002 - dried up due to climate change. 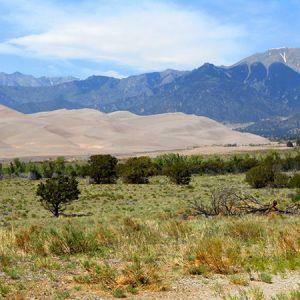 The predominant southwest winds blowing toward a low curve in the Sangre de Cristo Mountains helped form Colorado’s great sand dunes, and they still do today. How Are The Sand Dunes Formed? 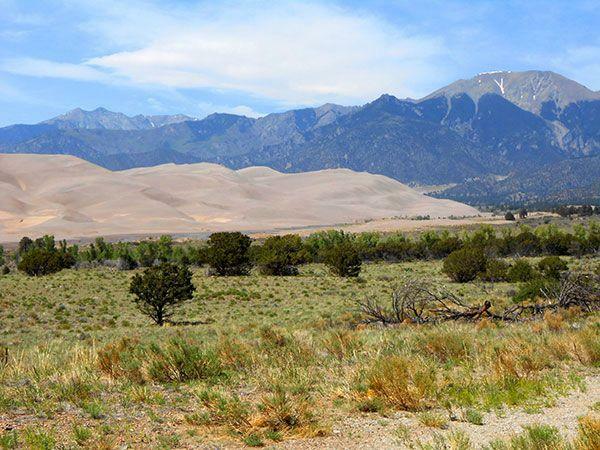 The Medano and Sand Creeks, two close mountain streams, drag sand from the mountain side of the great sand dunes and carry it around to recycle it on the valley floor. 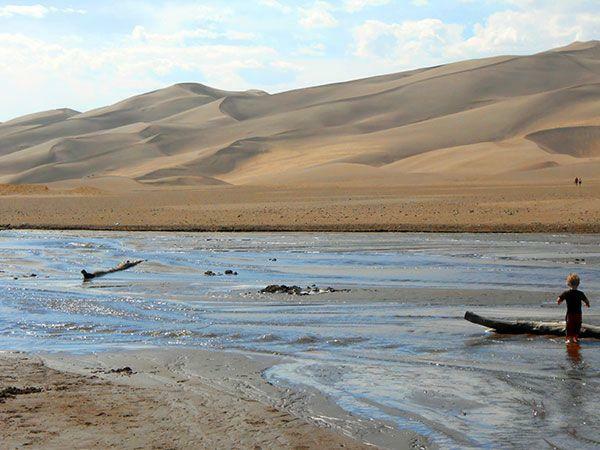 This constant movement of sand by wind and water help to preserve the Great Sand Dunes National Park, as well as their standing as the tallest sand dunes in North America. 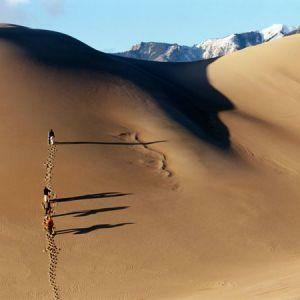 Many people have passed through, over and around the Colorado Great Sand Dunes for thousands of years (the oldest evidence of human inhabitants on the dunes dates back nearly 11,000 years), and there has always been a deep connection felt by those who've visited. From Native American traditions from the Navajo, Apache and Ute Tribes, to European and American settlers and homesteaders, these sand dunes have provided home and wonder to many groups over the centuries. 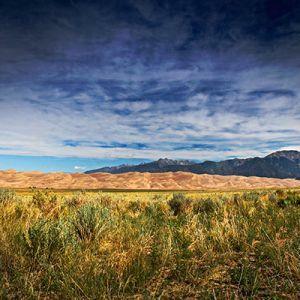 Partly because of these deep connections, and partly because of the long history of the Great Sand Dunes in the Southwestern expansion of the United States, they were given National monument status by President Herbert Hoover in 1932. 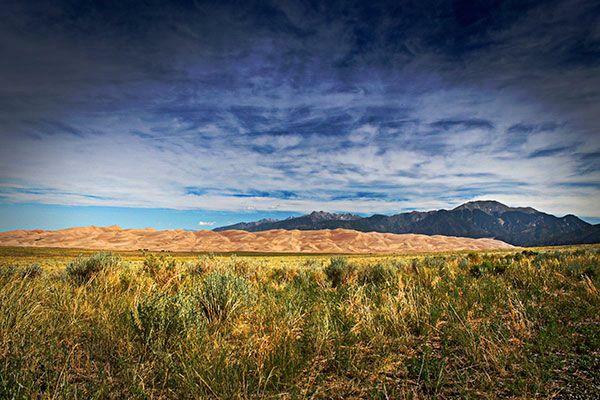 Between 2000 and 2004, the Great Sand Dunes National Monument was given National Park and Preserve status, and it remains one of Southwest Colorado's most beloved natural attractions even today. Learn more about how the sand dunes were formed here. How Do I Get To The Sand Dunes? 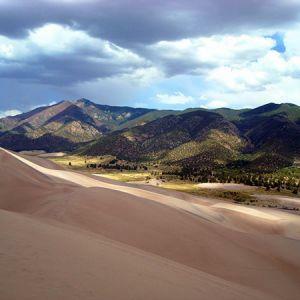 Just 35 miles northeast of Alamosa, the dunes are an easy drive via U.S. 160 and Colorado 150 from the south, or from Colorado 17 and Country Lane 6 from the west. 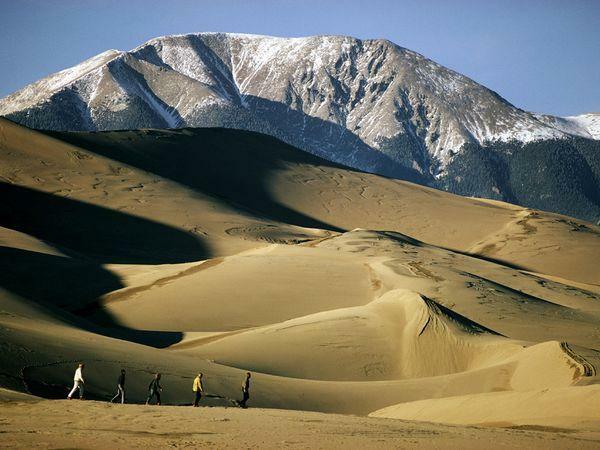 The Great Sand Dunes National Park is open 24 hours a day, all year. 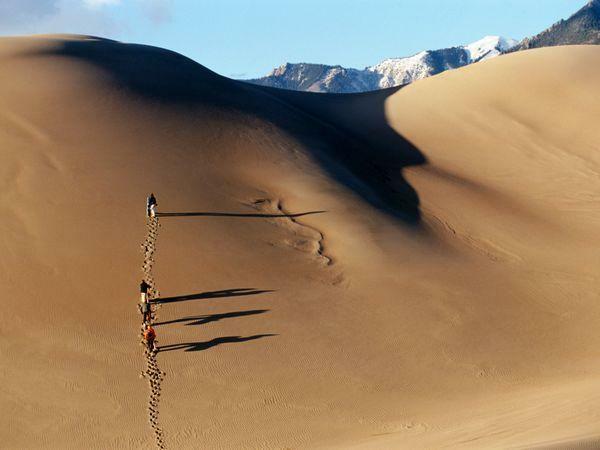 Consult the official Great Sand Dunes National Park and Preserve web site for information on fees and camping reservations. There are many events from May through September including the Summer Concert Series and Junior Ranger Day. Start your day at The Great Sand Dunes with a visit to the visitor center to watch a short film on the history of the dunes, see exhibits showing the unique formation of the great sand dunes, and get a lay of the land from local park rangers. 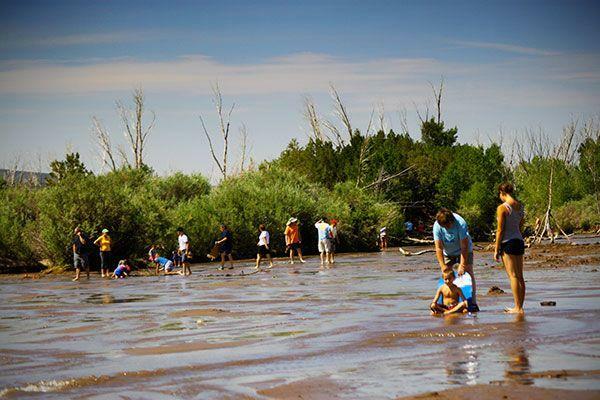 We recommend checking out the dune field from the main Dunes Parking Area, where you can explore Medano Creek, sand sled down the dunes or begin planning a 4WD tour through the dunes. With a little more time, you may want to look into the summer programs and events, especially at the Amphitheater. A wonderful hiking trip includes the Mosca Pass, where you can get great views and hear the wildlife all around you. 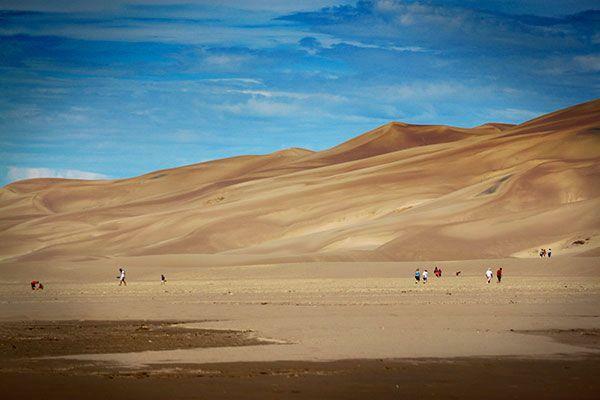 If you’re up to the challenge, you can hike the Star Dune, which is the tallest dune in North America, bring lots of water and be ready to get your feet sandy! 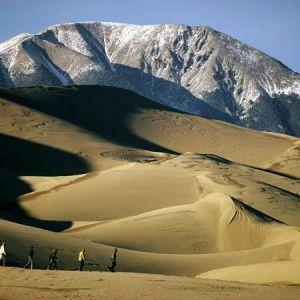 Sandboarding and Sand Sledding at the Great Sand Dunes National Park is a highlight for many families! Several retail outlets offer sand sled rentals and sandboard rentals including: Oasis Store (outside park entrance) rents equipment from spring to early fall, 719-378-2222. Kristi Mountain Sports in Alamosa (35 miles from the park on US 160 West) is open year-round, 719-589-9759. Sand Dunes Recreation & Hot Springs Pool near Hooper (35 miles from the park on CO 17 North) is open year-round, 719-378-2807. 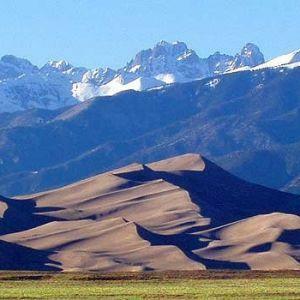 The Great Sand Dunes Weather is often dry and warm during the summer time, and during the winter you should expect colder weather. The Sand Dunes typically see 20-30 degree (F) higher and minus temperatures during the winter. Summer will see 70-80 degree (F) days and 40 degree (F) evenings. The spring and fall temperatures range between the summer and winter highs and lows. 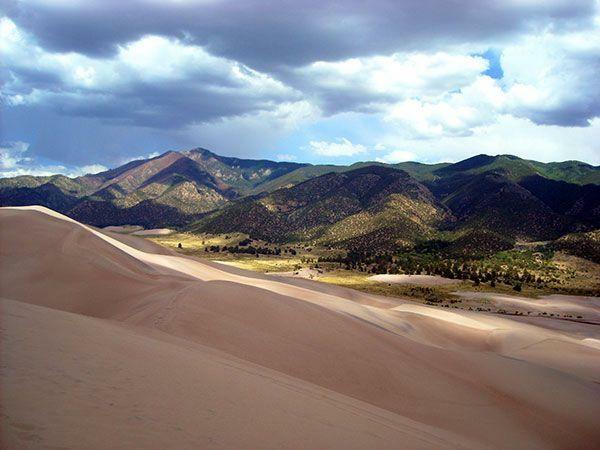 Spring often has high winds in the afternoon at the Great Sand Dunes, and even in March and April you should expect some snow if the weather is colder at the sand dunes. During the fall season, expect warm days and if weather patterns drive cold air through the sand dune region, you may experience ice and snow. 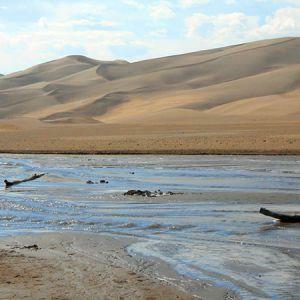 Wind speeds and precipitation can make a difference in the quality of your visit and to the Great Sand Dunes National Park’s weather patterns. The Piñon (Pinyon) Flats Campground is open in April through November and reservations can be made through recreation.gov, individual suites often run $20/night and a maximum of 8 people and 2 vehicles are requested per spot. 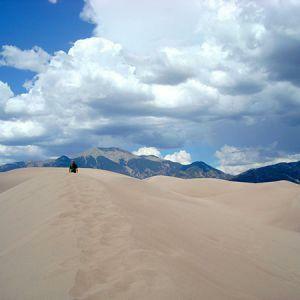 Group camping sites at the Great Sand Dunes are available. Additional camping areas around the Sand Dunes National Park include the Great Sand Dunes Oasis (tent and RV parking), The Great Sand Dunes Lodge (a more modern morel with an indoor pool), The Zapata Falls Campground (primitive BLM campground with gravel road access), and the San Luis Lakes State Wildlife Area (tent and RV Sites that are close by and a Colorado Wildlife Annual Permit is required). Pets are allowed as long as they are leashed while in the national preserve, however we strongly recommend that you consider the temperatures of the sand on the day of your visit. Temperatures of the sand can easily exceed 100 degrees (F) and on a hot day you will want to ensure that your favorite pet has lots of water. 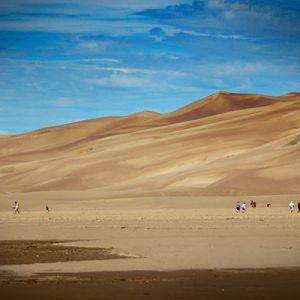 Don’t forget to pick-up after your pet so that others can enjoy Colorado’s Great Sand Dunes. The park web site includes information on geology, hydrology, ecology, and cultural history and includes materials for teachers and kids. You can help support the dunes at Friends of the Dunes.